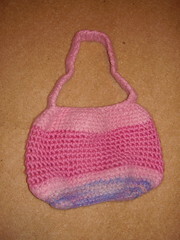 I improvised a bag in crochet... quite cool for me to do because a) I don't crochet and b) I don't improvise! With the scrap of the Anchor Filz It wool, I made a little felted headband for Junie B. It's in a nice floppy bow on her head now.